My children loved our trip to South Africa. Of course, the extra bit of summer sunshine and pool time in the middle of an English winter was a big hit. There are lots of places in the world you could get that though. 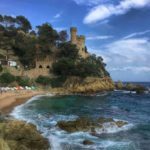 What made it a cut above the rest of the winter sun destinations? 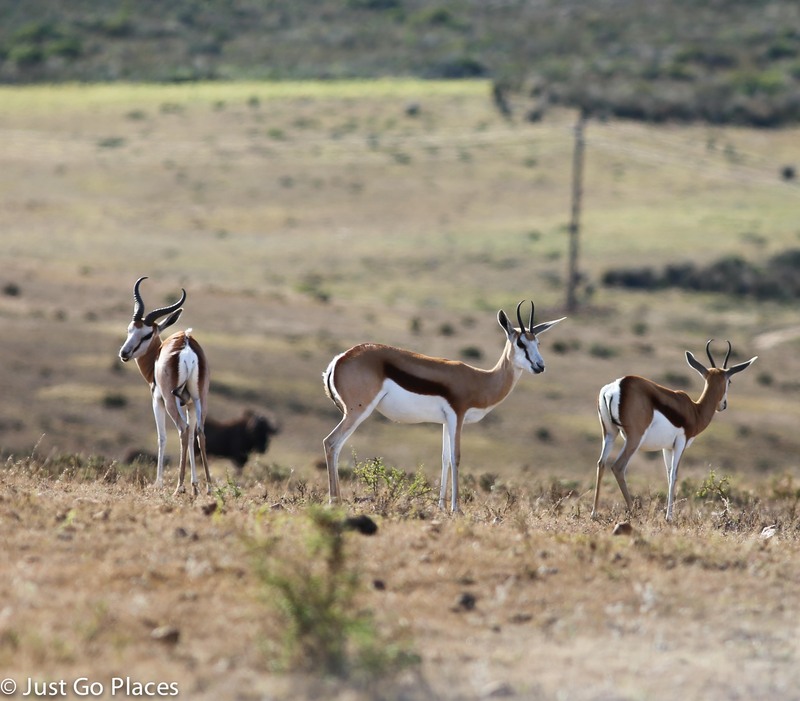 Pure and simple – the wildlife in South Africa. It was such a treat seeing so many different types of animals in their natural habitat doing their thing. 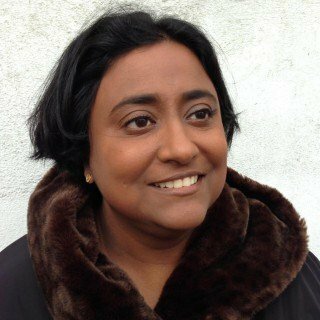 7 Join our growing community of readers! 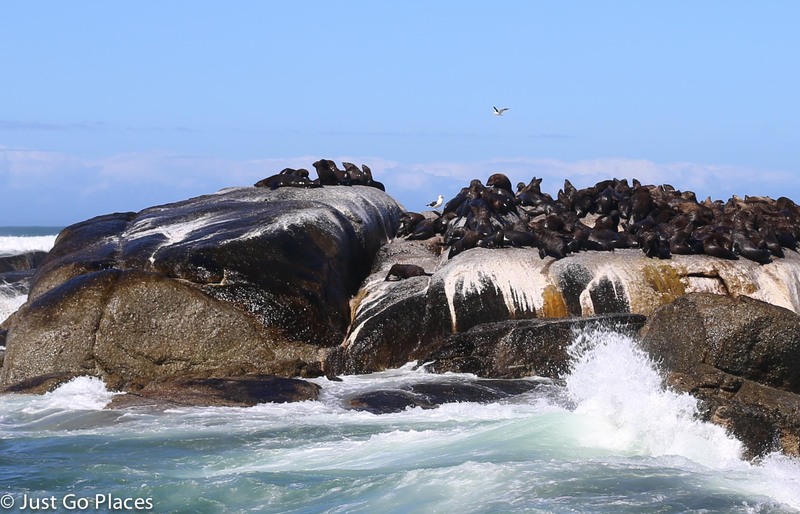 We took a boat to see the seals off the coast of Hout Bay on a nature reserve nearby. There were hundreds of seals just hanging out playing in the water. 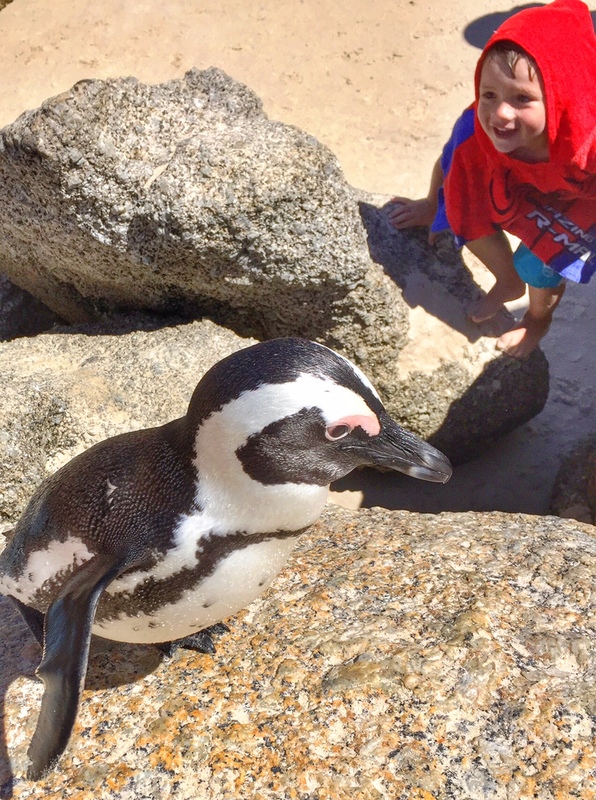 The visit to Boulders Beach was hands down the favourite thing we all did on our entire holiday. The penguin colony nearby regular wander over to the beach and walk and swim alongside humans. I wasn’t entirely sure what to expect on a beach popular with penguins. To my surprise, the beach was clean, penguin poop-free and didn’t smell. Moreover, the water was fairly shallow which made splashing about fun for young children. 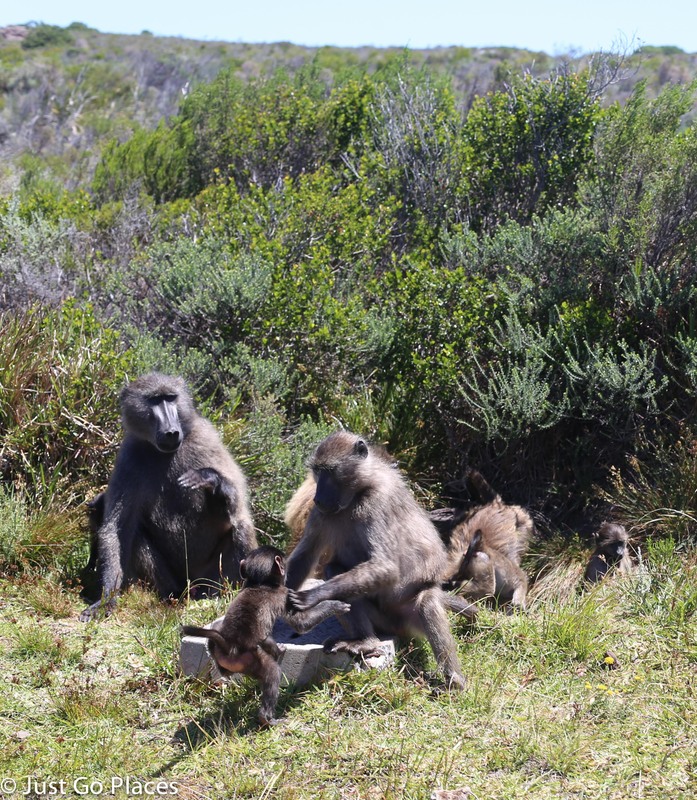 We saw baboons in several places most notably at the Cape Point reserve but also wandering along the highway. They are considered pests but we kept our distance and enjoyed watching the young ones play. Our 2 day mini-safari experience was a fabulous introduction to a full-blown safari. The children loved seeing all of the different animals up close and personal. 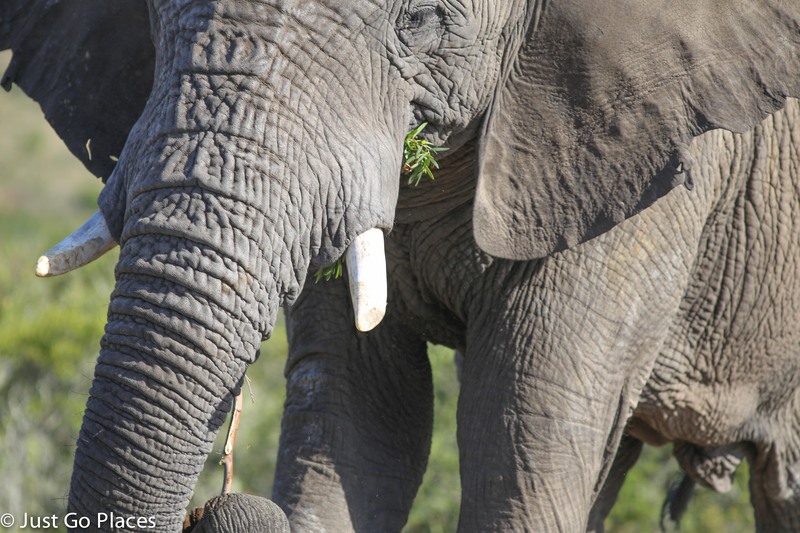 We had the elephants who spent their time munching on leaves and playing with each other. We chuckled at the young giraffe who insisted on walking a certain distance away from his parents. He was not ready to wander off on his own but he also wanted his space. 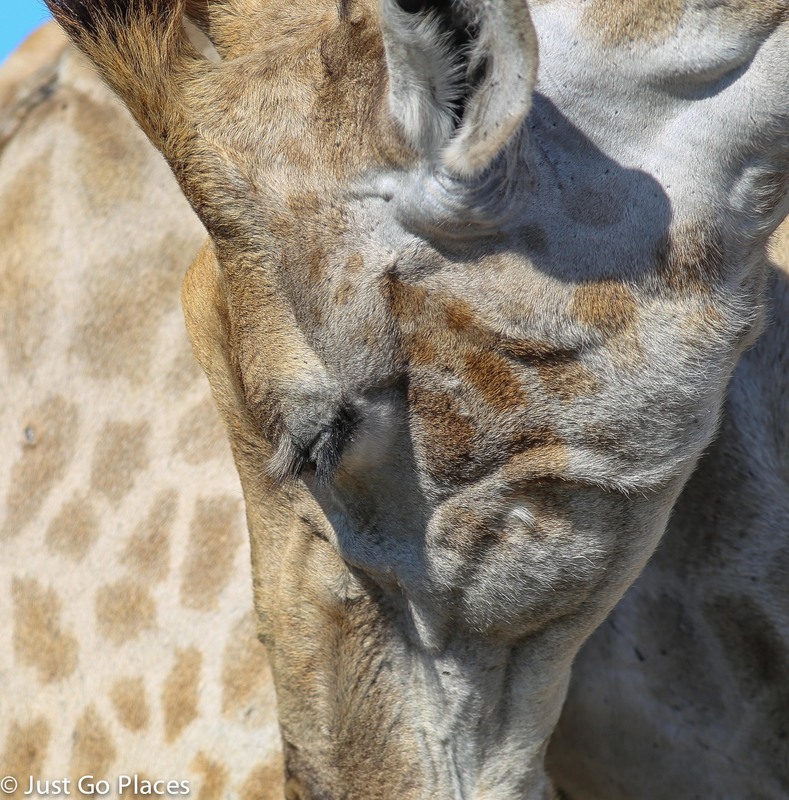 Did you know that a giraffe has really long eyelashes? We felt sorry for the white rhinos who had to be under constant surveillance because of the threat of rhino poachers coming to hack of their horns. The lions just hung around looking majestic. 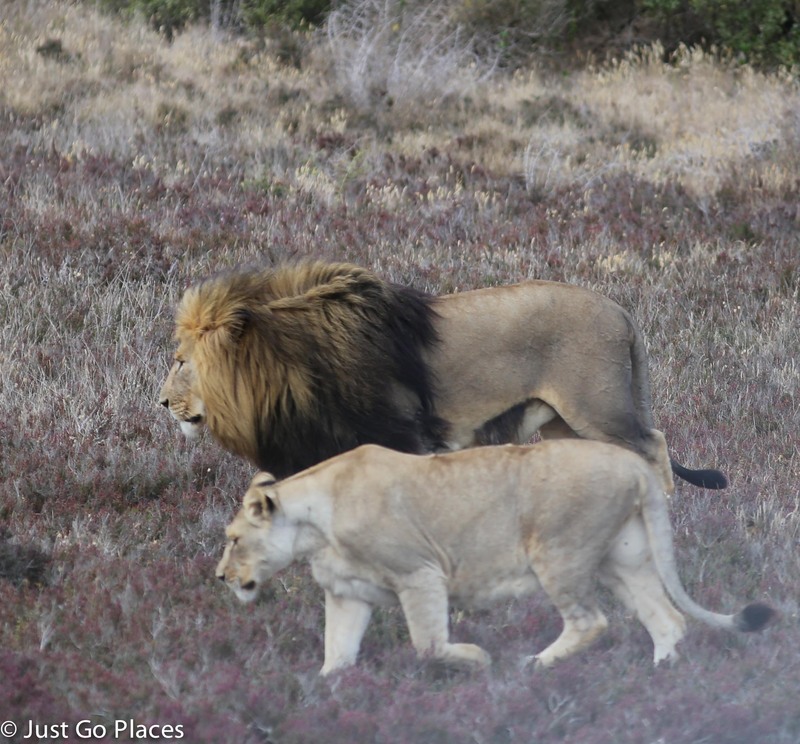 The male lion was fairly complacent with his little harem of female companions. The springboks were beautiful to watch especially when they were running. 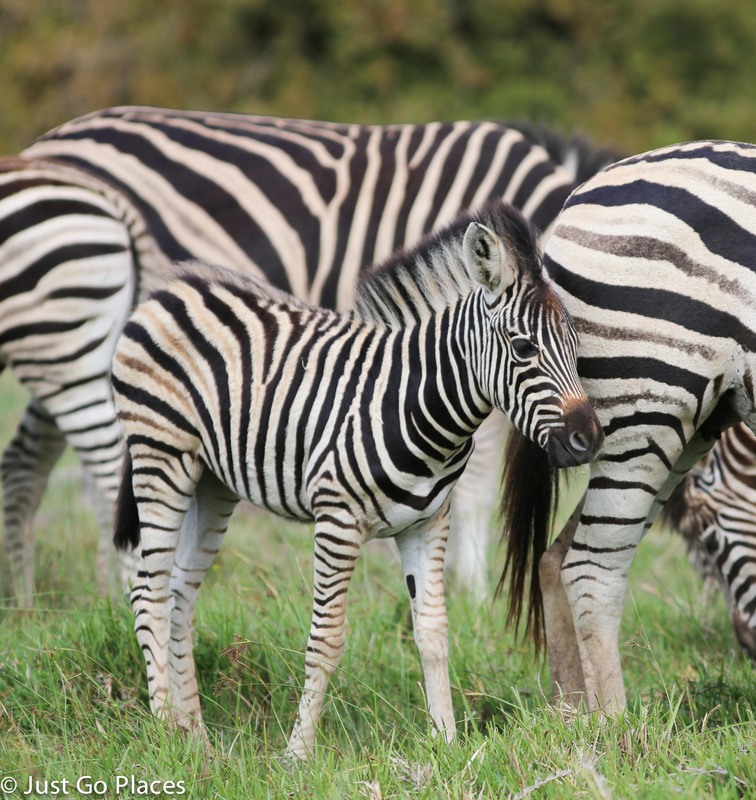 We discovered that zebras are actually black with white stripes. They can also be pretty bad-tempered and kick smaller animals. 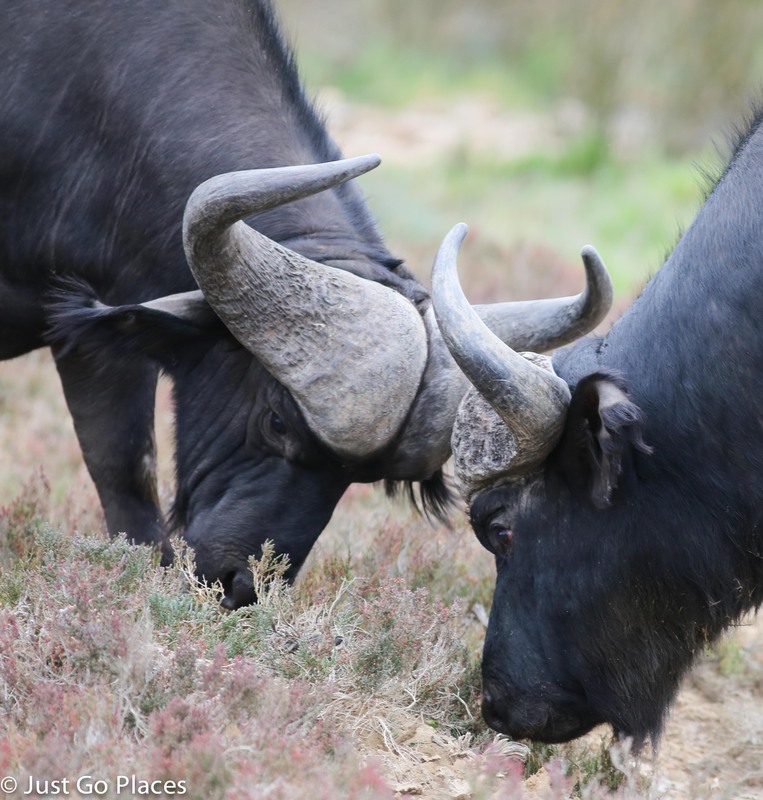 We saw several skirmishes between the cape buffalo males who were constantly butting heads (literally) for dominance. We caught only a glimpse of a cheetah in the underbrush. He had just feasted on a small antelope and was passed out in a food coma. The children were remarkably sanguine about seeing a half-eaten antelope on the ground. Much to my dismay, my son was desperate to go in a shark cage tour. Frankly, my husband wasn’t enthusiastic either because my son assumed his father would go with him. We managed to pacify him by saying he could go when he was older (in his mind, that meant aged 10 but I’m thinking closer to say… oh, never!). Right about that time, too, I’ll let him go bungee jumping in South Africa too. My daughter would have loved to go horseback riding in the Cape Point area. Unfortunately, the minimum age was 14 years old. You needed to be 14 as well to go walking with cheetahs at their sanctuary as well. (Cheetahs consider children small prey so there are age and height restrictions). 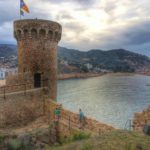 Other interesting wildlife expeditions we would have liked if there was only time were the elephant sanctuary and whale watching. 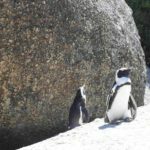 The Cape Venues website has a good list of many different animal-centered activities. If your children love animals (and most of them do! ), South Africa is a great introduction to wildlife in Africa especially for the younger set. You don’t have the worry about malaria. It’s easy to get around and convenient. There are lots of variety of animals to see. You really just can’t beat seeing wild animals in their natural habitat. What a fabulous trip!! I would so love to see all those animals. Your kids are really lucky!! She’ll appreciate it when she’s older! I wouldn’t want to do a 12 hour trip with a toddler! Thank you! It was definitely amazing for all of us. Amazing photos! Looks like you all had a great time!